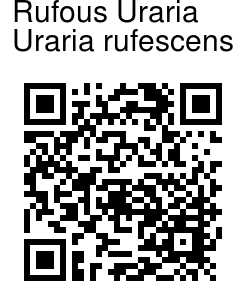 Rufous Uraria is a subshrub with stems erect, 40-100 cm tall, gray-white hairy and brown hooked hairy. Leaves are 3-foliolate; leaf-stalk 1-2.5 cm, hairy; leaflet blades elliptic or ovate-elliptic, 3-8 × 2-4 cm, below hairy, above hairless, lateral veins 11-13 on each side of midvein, base rounded or slightly heart-shaped, tip rounded or sometimes notched. Flowers are borne in an inflorescence at branch-ends, 10-20 cm, densely hooked hairy and velvet-hairy. Flowers are sparse. Flower-stalk short, initially about 3 mm, hairy, elongated to 5-6 mm at fruiting, apically hooked. Calyx is about 3 mm, velvet-hairy, 5-parted; lower lobes longer than tube, upper lobes slightly shorter. Flowers are purple, 2-3 times as long as calyx. Legume 4-7-jointed; arti­cles gray-brown, compressed, slightly netveined veined. Rufous Uraria is found in Indo-Malesia. 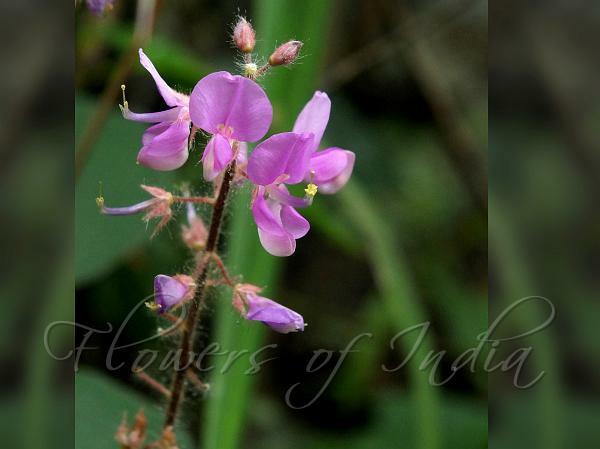 In India it is found in Peninsular India and the Himalayas, up to altitudes of 1000 m. Flowering: October-November. Identification credit: Navendu Pāgé, Siddarth Machado Photographed in Satyamangalam Tiger Reserve, Tamil Nadu.